For weeks now, devastation and risk have surrounded us. Missiles fly over Japan and hostile rhetoric continues, while Texas faces a tragedy of biblical proportions. Yet the financial markets appear unfazed by recent events, with stocks continuing to post new highs. Investors question if the market will continue to be immune to these and other risks. Technology and healthcare stocks have regained leadership from industrial, materials, and bank stocks as the “Trump trade” has cooled. Tech stocks returned 3.5% in August and are up 26.6% for the year. Healthcare firms, apparently more profitable under Obamacare than they would lead us to believe, show 19.1% gains YTD. The biggest loser for the year continues to be energy stocks with a 15.1% loss. Telecoms also are down 7.9% this year. The U.S.-based S&P 500 gained 0.3% in August and registered a total return, including dividends, of 11.9% so far for the year. Large foreign shares were flat for the month but continue to outperform with the MSCI EAFE index up 17.5% in 2017. 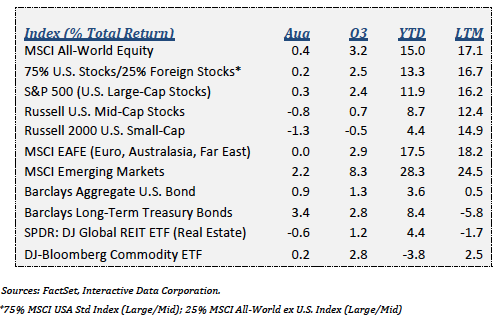 The emerging markets lead all broad stock measures with 28.3% gains this year. Overall gains this year have been better than most anyone predicted. Investors did not bail when Congress proved incapable of solving the healthcare problem. Tax reform is now center stage and has the potential for a more immediate financial impact. We foresee some disappointment if nothing happens on a tax package, but that alone will not likely cause a precipitous drop in stocks. The good news today is the global economy is growing, employment levels are at record highs, and inflation remains quiet. Central banks, while starting to withdraw some excess liquidity, show no inclination to rush the process and continue to provide monetary support. Aside from the geopolitical uncertainty, the biggest risk is that investors are too complacent. It has been over 18 months since the last 10% correction. Many have forgotten what a pullback feels like and may not be emotionally prepared. Stock investors should always be prepared for a major decline, not because one is necessarily looming, but because the markets are difficult to predict. We believe attempting to precisely time the stock market does more harm than good. The best defense is broad diversification and a consistent framework for investing based on sound, evidence-based principles. A well-known study from the 1980s concluded that 93.6% of a portfolio’s return variability is attributable to the asset allocation decision. * The implication is that selecting a mix of stocks, bonds and other assets is more important than picking individual stocks and bond securities in your portfolio. Over time, this study has drawn some criticism, but the main observation holds; the overall fluctuations in the stock and bond markets are the largest driver of investment returns over time. There is no magic solution, but an appropriate mix should meet your long-term return goals and offer enough stability to stay the course though tough times. To establish the right policy for you, we need to consider the important characteristics that will determine the return you need and risk you are willing to take. Amid all the financial products, funds, indexes, investment styles and strategies, it can be difficult to filter out what is important when choosing assets for your portfolio. We think the evidence over the past 100 years of financial market data is a good starting place. That is not to say that future returns will be as high as they have been. However, history has taught us that taking certain risks has been rewarded. In most countries, stocks outperform bonds. The excess return of stocks over bonds has varied depending on the country, but the basic premise holds that stock risk has been rewarded. In the US, for example, stocks returned 9.6% between 1926 and 2009. During recessions generally speaking, corporate profitability falls and some companies go bankrupt. These downturns are very hard to foresee, so this higher average return on equities is compensation to investors for this economic uncertainty. Long-term bonds outperform short-term bonds. Parting with your money for longer periods involves taking certain risks. In government bonds, that risk is primarily the risk of getting paid back in dollars that buy fewer goods in the future than today or what is referred to as inflation risk. Purchasing a 10-year bond is riskier than buying 10 consecutive one-year bonds. Because of the added risk, the market tends to discount long-term bonds over short-term bonds, hence boosting return expectations. For corporate debt, there is the added risk of default, which has added only marginally to their excess returns of government bonds. Lending your money in the bond market or owning a small piece of many companies generates a positive return over the long haul. For an investor willing to withstand short-term market fluctuations, growth and inflation risks serve as return generators over time on your money. Not all risks are created equal, though. Stocks tend to have bigger drawdowns and more volatility. The higher return over the long run is a reward for taking this risk. Bonds and other assets with more stable cash flows have historically had lower drawdowns. This makes them more attractive for investors that demand income in the near future because the risk of selling at depressed prices is much lower than for equities. While the return and volatility characteristics are key factors in choosing an appropriate mix of stocks, bonds and other assets, how they interact is also another major consideration. Diversification is the cornerstone of asset allocation. In its essence, an asset that zigs when another zags accomplishes this. If constructed correctly, your portfolio should be less variable than the components. However, a portfolio’s diversification is often less than ideal because many assets are driven by the same factors. Some studies have shown that a broad survey of publicly traded assets is largely driven by two predominant risks - growth-like risk represented in stocks and the inflation risk of bonds mentioned above. ** Typically, these two factors tend to work in opposite directions, smoothing the ups and downs of each other. In some cases, they work together, boosting returns of both stocks and bonds. Nevertheless, diversification works best when you own some assets that have good returns when others are struggling. We took a broad sample of assets that typically make up many institutional and individual investor portfolios. We averaged the quarterly returns of all assets during the worst 20% of the returns for the S&P 500 and also for long-dated treasuries. These returns are displayed in the chart on the following page. When growth-related assets like stocks do poorly, long-dated treasuries and global bonds do well as economic growth is called into question and excess capacity puts downward pressure on inflation. Alternatively, when treasuries do poorly, global stocks tend to do well because the economy is picking up steam and inflation expectations are increasing. An investor banking on diversification from international equities, both developed and emerging, would be disappointed as these assets declined similarly to US stocks. While there are good reasons to spread equity risk internationally, an investor needs to look elsewhere during stressful periods. Also note that high yield bonds, though technically bonds, behave more like stocks than treasury bonds. An investor banking on credit-sensitive bonds to hold up during poor equity market periods may be surprised. Looking beyond the labels of “stocks” and “bonds” can help identify the types of risks that will drive asset returns. It’s difficult to know ahead of time which asset is going to lead the markets. Preparing for a range of scenarios is the only sensible strategy. Often times, overconfidence gets in the way of setting a prudent portfolio. This portfolio should form the base on which you can grow your wealth and meet your goals. What Determines the Right Allocation for You? To make this successful, an investor has to ultimately balance their portfolio between economic growth (stocks), or the risk of higher inflation (bonds), but often, personal considerations outweigh economic ones. First, we start with your goals for your money, which we addressed previously. Are you in the decumulation phase, steadily drawing on your portfolio? The sooner you need the money, the greater the chance you may be forced to sell stocks at inopportune times, a toxic combination for maintaining wealth. Another consideration is the nature of your other assets or sources of income. We want to extend the concept of diversification outside of your investment portfolio. If your income is highly leveraged to the ups and downs in the economy, you may want to consider owning more bonds. On the other hand, if your income is relatively immune to recessions, you may have the ability to weather the natural downturns in the stock market. Others might have a solid pension that may cover the majority of living expenses, reducing your liquidity demands on your investments. A key tenet of successful long-term investing is to have the ability, emotionally and financially, to weather the downturns of the asset you own. The more those downturns coincide with a greater need to draw on your investments, the more beneficial to allocate away from that asset. It can be hard to maintain faith that the markets will hold up when it seems as though each day the geopolitical risk deepens. Unfortunately, the markets have a long history of making fools out of people who thought the market ought to behave a certain way. A proper asset allocation balances the risk you need to achieve your financial goals but also allows you to sleep well at night. If the risk is dialed incorrectly, the result may be abandoning a strategy at the worst possible time. Access to the financial markets has never been better. The advent of the exchange-traded-products, offering exposure to broad markets, allows investors to establish a customized core portfolio for a very low cost. Setting this low-cost, core portfolio in place is a crucial step for a successful investment strategy. * Brinson, Hood, and Beebower. “Determinants of Portfolio Performance.” Financial Analyst Journal. July/August 1986. ** Bhansali, Davis, Rennison, Hsu, and Li. “The Risk in Risk Parity: A Factor-Based Analysis of Asset-Based Risk Parity.” Journal of Investing. Fall 2012 Vol. 21 No. 3.